Special Containment Procedures: SCP-2022 is to be stored and organized within a pitch black biohazardous storage room at a controlled room temperature of 10°C. Prescribed use of the supplements must be approved by the site director and medical staff. Over-dosages must be reported immediately to on-site physicians. Overuse of SCP-2022 is prohibited outside of testing purposes. 5,000 Pharmaceutical blister trays (10-day) in paperboard packaging. 775 cGMP-compliant 210L drum liners labeled with respective brand name. (192 Seychelles®, 296 BoraBora®, 287 Bahamas®). 31 plastic containers labeled "EXPERIMENTAL SUBJECT #00-30". 90 cGMP-compliant foil laminate bags labeled "WARNING: UNREFINED MATERIALS". SCP-2022 are [SR] gelatin capsules that compress and constantly emit electromagnetic energies similar to sunlight and contains other unknown active ingredients, two of which are labeled Lumen and Kelvin (K), based on the packaging. How the capsules are able to compress and contain "sunlight" into a measurable and administrative form are currently unknown, with chemical analysis of the compounds used in synthesizing the drug yielding no results. Ingested orally, 1 dose of SCP-2022 steadily supplies the body with healthy, daily amounts of Vitamin D for up to an average of 16 months (487 days). Subjects taking the supplement have reported feeling a gentle tropical breeze, scents of sea water, faint sounds of crashing waves, and a pleasant warmth within their bodies that fluctuate in intensity coinciding with the time of day,1 although the sensation varies depending on the subject's skin pigmentation level and the brand of supplement taken. Increased bone health, skin complexion, and hair growth, along with significant decrease in infectious and autoimmune diseases have also been documented, but these results remain under further investigation. SCP-2022's effects accumulate exponentially, with each dosage (depending on brand) taken consecutively, increasing the effects as well as introducing various other hazardous and anomalous effects. Overuse of the supplements increase this sensation, with the test group experiencing increased burning sensations in organs, development of photosensitivity, sunburn, inflammation, dim to intense bioluminescence, Hypervitaminosis D, vomiting, nausea, dehydration, decreased appetite, insomnia, constipation, fatigue, irritability, myasthenia, and metastatic calcification. Other severe cases have reported various forms of cancer, large kidney stones, hypercalcemia, xeroderma, actinic keratosis, polymorphous light eruption, cataracts, macular degeneration, immune suppression, abnormal vascular functionality, solar elastosis, 1st-3rd degree (internal and external) burns, invisibility from the visible spectrum, and [REDACTED]. Individuals with skin coloration classified as Type VI (35+) on the Fitzpatrick scale have been shown to suffer abated to nullified effects from taking the prescribed or overused dosage of SCP-2022, compared to Type I-V. Individuals with albinism, surprisingly, show the same resistance to the hazardous health-effects of over-dosage as well, but are more susceptible to the anomalous effects of invisibility from the electromagnetic spectrum, intangibility through translucent objects, intense glowing and emission of UV light and gamma radiation, and achieving temperatures surpassing [DATA EXPUNGED]. Addendum 2022-01: SCP-2022 was created by the now-defunct Sunset Laboratories, a pharmaceutical research and development lab owned by the company ████████ Pharmaceuticals, headquartered in ████, France. The drugs were discovered during a drug raid on the suspected pharmacy, which was abandoned overnight, revealing a hidden basement locked behind a high-security door. After the security door was breached and the basement laboratory inspected, it was revealed the lab was stripped clean of all physical and electronic documents and data. The lab was found to be connected to an underground tunnel network connecting to the l'Ossuaire Municipal in Paris, France, suspected to be the method of escape for the Sunset Lab employees. The drugs were confiscated by the DEA and were immediately turned over to the Foundation. No records related to Sunset Laboratories, its employees, SCP-2022, or the company ████████ Pharmaceuticals have been recovered since the raid, with investigations still ongoing. 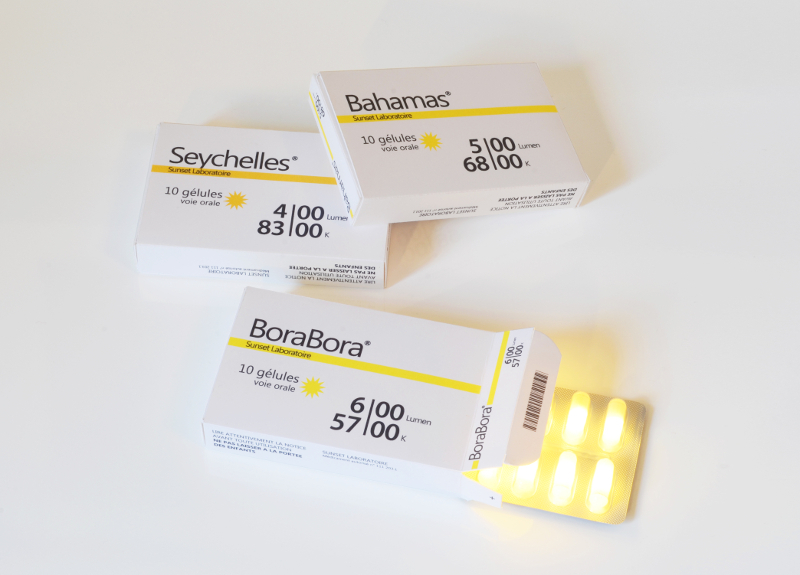 Addendum 2022-03: Blister trays of SCP-2022 have been categorized into several product brand names, including: BoraBora®, Seychelles®, Maldives®, Bahamas®, and Haiti®, each having their own dosages of the active ingredients, Lumen and K. The Maldives® and Haiti® brands have not been found among the drugs collected, presumably unlabeled or non-existent. 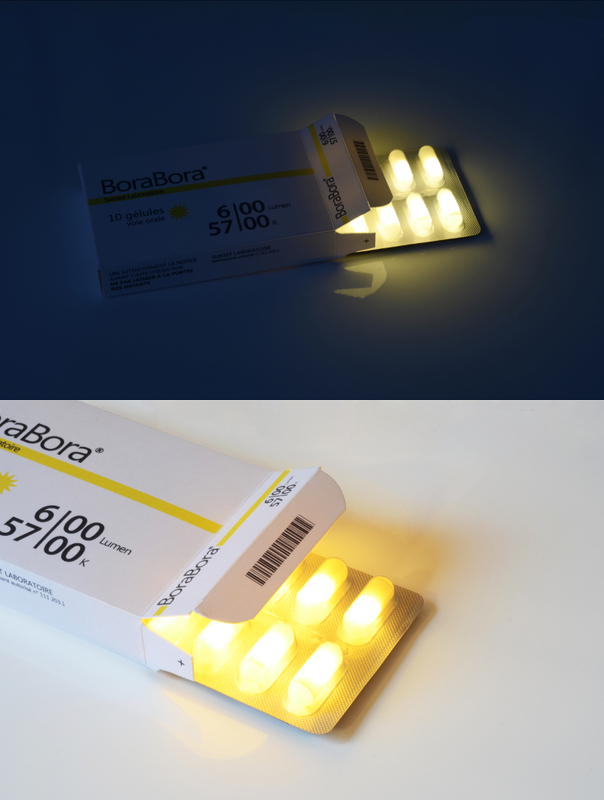 The packaging of SCP-2022 appear to be conceptual designs, lacking supplement/drug facts typical of FDA-approved OTC (over-the-counter) drugs. After extensive testing and experimentation with the drug, the Foundation medical staff has approved prescribed use of the supplements to Foundation personnel. The confiscated drum liners all contain the processed brand of drug supplement corresponding to their respective label. These were speculated to be drug barrels delivered to the pharmacy for pharmaceutical packaging. Given their abundance and consistency to their packaged form, these drugs are allowed to be used in place of the blister trays for testing and experimentation purposes only. The 31 bottles collected all contain various unit dosage forms of the supplement, several of which have unique drug-delivery systems. The dosage forms include: tablets, caplets, powder, solid crystal, liquid suspensions, thin films, topical cream, deodorant, pastes, balm, otic and ophthalmic drops, vaginal rings, transdermal patches, and various suppositories. All units contain a weakened incarnation of the drug meant for experimentation purposes. Due to the scarce supply available and possible risk-factors, experimentation with these unit forms is not allowed at this time. The foil laminated bags contain unrefined and unstable versions of the supplement. The unrefined supplements have high brisance, and are extremely sensitive to detonation, the explosive velocity of 1 capsule reaching up to [REDACTED]. Being unrefined materials, taking this form of SCP-2022 is not recommended by any means. Following the events documented in Incident 2022-SOLAR-12, pill-splitting or any other invasive methods are strictly prohibited, and all foil bags of SCP-2022 are to be contained separately from the other instances of SCP-2022. 1. The time of day is based on the current timezone of the isles each brand is named after. This has no effect on subjects' sleep cycle.